← all you need is love. I love these thumbprint trees as an alternative to the standard guestbook. I think it will look lovely in its frame, hung on the wall. You can find these on Etsy, but they can be expensive and also we’re running out of time. The Groom is going to design and print the tree – I just need to get a frame, ink and something for guests to clean their fingers with! A container of Wet Ones isn’t pretty… Hmm. Any suggestions? 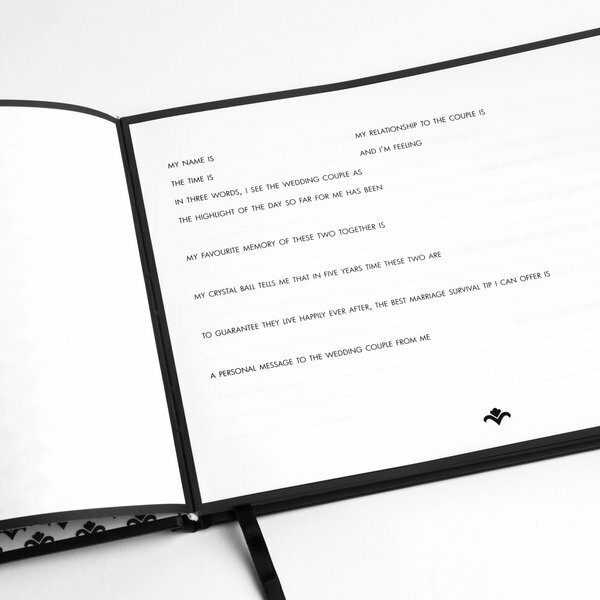 kikki-K has a great option for standard guestbooks – the ‘Klassisk’ Guest Book Questions. I love questions; I think it would be fun, and easy, to fill in! would be nice so nice to read over the book throughout the years of your marriage! will definitely be pocketing these for wedding when ever that day may be! for a cleaning idea, why not a wet spongde in a glass dish/bowl. Like you see at the post office for stamps. You could get pretty gift wrap and some ribbon and wrap the container of wet wipes? It’s up to you if you want a guestbook as well! I think I have looked at mine a total of twice in 3 years. LOL! Wow., I’ve never seen this, its great isn’t it.., lovely idea. Thanks Anna – I think it will look so nice framed in our house. I think it would be nice to have both. I know that people don’t often look at their guestbooks but it seems like a shame (for both you and your guests) if your guests can’t leave you a little message.